A cracking night of Rock Covers from Steeler from approx 8.45-11pm. £3 @ the door (Free B4 8.30pm) We rock thro till 3am after the live set. 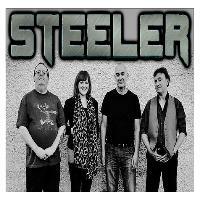 STEELER are a Four Piece Classic Rock Covers Band. Currently gigging around Edinburgh, Lothians, Central Scotland and Fife. Since 2005 we've been playing authentic covers of rock music from the 1960’s onwards. 2017 sees the begining of a new era for the band. With the retiral of Les we have been given the opportunity to bring in Bekah Mhairi Comrie on lead vocals. Her fantastic vocal range and style now allow us to focus on an entirely new set of female vocal rock and pop classics from the 60s to current date. From tina Turner to Adele, Janis Joplin to Duffy, we have it covered! The Rock Continues till 3am at Scotlands Longest Running Rock Clubs thro till 3am. Entry to the Club is included in your Gig cover charge - Something you DON'T get anywhere else !